Transliteration was explained on my page: What is Transliteration?. I do not prefer transliteration. The Gujarati keyboard or Gujarati Phonetic keyboard are superior because they offer predictability to what you are typing and is more efficient. However, if you still want to use transliteration, here are the strict rules. Transliteration rules may vary from tool to tool because there are no standards. However, here are some basic rules. Full consonants: To type full consonants, one types the English phonetic equivalent with "a". To type 'મ', one types 'ma'. Table 1 lists the consonants and their phonetic equivalent. Transliteration is case-sensitive. Half forms: To type half forms, one would omit the "a". So, મ્‍ would be "m". Conjuncts: To type conjuncts, one would simply type the combination. ત્મ્ય would be tmya. Remember the "a" at the end since ય is full. Vowels: using ક as an example, Table 2 shows how to form the different vowel sounds. I have not found a way to type the candra vowels yet, and I believe the method to these probably vary from tool to tool. There are various transliteration tools available online. Each follows some basic rules but many vary a bit. One such tool is the Pramukh Type Pad. It's an elaborate tool which allows you to choose from several Indic languages. Another tool similar to Pramukh Type Pad is Quillpad. According to the home page, it's an intelligent tool that guesses what you are typing and offers you word suggestions. Word suggestions might actually slow you down. It compromises the transliteration rules because it senses what you want to type without the extra keystrokes. For example, if you want to type મહારાજ, one would usually type "mahaaraaja." However, with Quillpad, one only needs to type "mahara" and a list of words are suggested. It's awkward, however, to have to choose the word every time. When I simply typed "maharaj," I was given માહરા (it insisted on omitting the જ). "Mahaaraaj" gives me the correct word while "mahaaraaja" gives me મહારાજા. Google also has a transliteration tool found at Indic Transliteration. It's also a smart tool that avoids you having to type redundant keys. For example, તમારી would be normally be written as "tamaaree". However, with Google's tool, one can type simply type "tamari." It's sort of like an AutoCorrection feature. Search on the Internet reveals there are many offline transliteration tools available. One such tool is the Indic IME for Gujarati found at BhashaIndia.com. This program offers several input methods, one being transliteration. The screenshot on the right shows Notepad in Windows XP with Gujarati LIP installed. 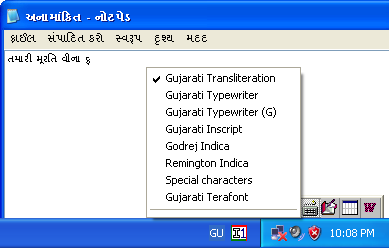 The small toolbar above the system tray is the Gujarati IME program that is activated when one switches to Gujarati input. The menu shows several input methods, with the first one being transliteration. This program also allows one to save a word that avoids you having to type the transliteration. For example, if want to type "Microsoft" in Gujarati, you would have to type "maaeekrosofta". However, you can create an exception such that typing "Microsoft" will auto-replace the correct Gujarati form. It's not a completely smooth implementation, however. If you want to try this program, you will have to install Gujarati language input in Windows before installing this program. The steps are found at the download site and here. Transliteration is a great and easy way to type Gujarati. However, it's not the fastest. Also, when you want to search for Gujarati filenames, you would have to cut and paste if you are using online tools. Next, I an even faster method using Gujarati keyboard layouts.